Diamine Arabian Nights is the final ink from the 2017 Diamine Shimmertastic collection. I purchased my sample of ink from Vanness Pens. Arabian Nights is a dark blue with silver shimmer. The ink drops are beautiful-mostly shimmer. Bleeding: Low-there is just a little bleeding in the flex nib on Tomoe River paper. Other properties: Medium shading, a tiny bit of sheen that shows only in large swabs and ink drops, and silver shimmer. On 20 pound copy paper, the ink did rather well, just a little bit of feathering. 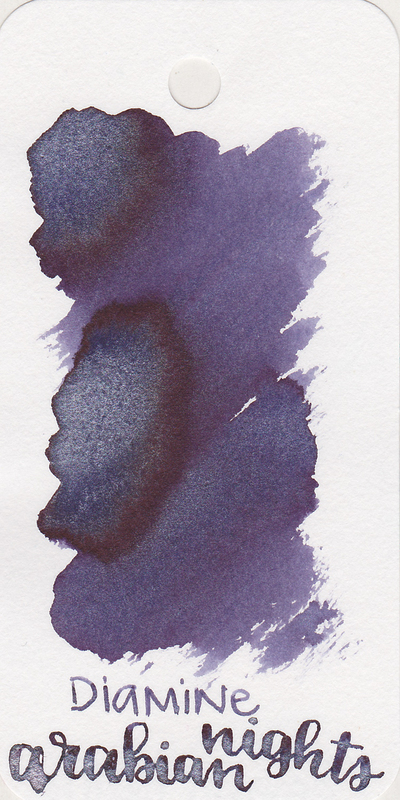 Ink swabs for comparison, left to right (top to bottom for mobile RSS): Diamine Cobalt Jazz, Diamine Arabian Nights, and Diamine Frosted Orchid. Click here to see the Diamine inks together. For a while I couldn't decide if Arabian Nights is blue or purple, but I think it leans a bit more to the blue side. Diamine Tudor Blue, Robert Oster Evening Sapphire, and Robert Oster Blue Water Ice. Click here to see the blue inks together. I used a fine Visconti Rembrandt on Tomoe River paper. The ink felt average in flow, maybe a touch on the dry side. Overall, I really like the color of this ink. It behaves rather well, and looks great with the silver shimmer.